​Ann Schuyler (Harlow) is a young rich girl who seduces, then marries a young reporter thinking she can change him from a wisecracking muckraker to a respectable playwright. Stew Smith (Williams) is just looking for a scoop when meets Ann and becomes smitten by her obvious charms. Once married, it becomes clear that Stew would rather hang out with his buddies from the paper, including Gallagher (Young) & Bingy( Walter Catlett) than with Ann’s society friends. When friends & colleagues predict he will end up as nothing more than a gilded bird in a cage, Stew takes stock and rebels, hosting a raucous party at Ann’s family mansion. When the Schuyler’s return to find the party in full swing Stew is at first apologetic, but when it becomes clear that he is nothing more than a visitor in the Schuyler’s home, he leaves with Gallagher. Finally back in his own apartment, he is able to dictate the final act of the play he’s been working on at Ann’s request, noting that the protagonist will divorce the rich wife and marry the right girl (Gallagher). ​Platinum Blonde is perfectly entertaining. The fact that Harlow is completely miscast doesn’t ruin the picture, it just casts it in a different light. Much like Carole Lombard was misused in her early talkie roles, Harlow’s handlers were still casting about for a suitable persona for her. Since she was on loan to Columbia for Platinum Blonde (ironically where Lombard found her footing in Twentieth Century), somebody must have thought Harlow could pull off an upper cruster. Sadly, she could not, but happily there are physical manifestations of the actress she would soon become. As noted she didn’t really do “high society” very well, but the gestures and poses that would become so much of her characters to come are evident here: the hand on hip, with the hip thrown out, finger pointing and waving when admonishing a lover & finally the whip quick dialogue that made her famous less than a year later. 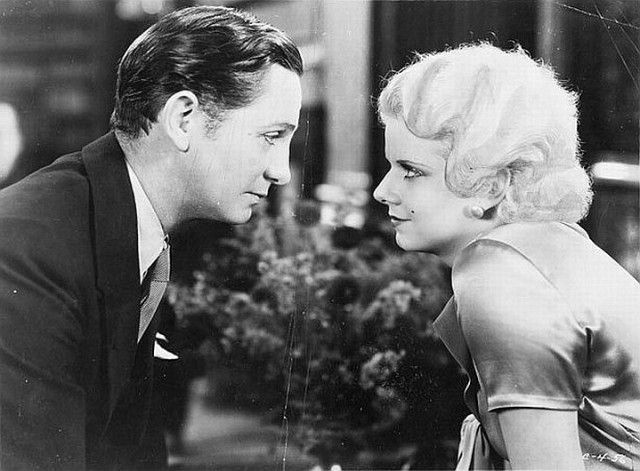 What was clearly apparent in Harlow’s performance, however, was how she was growing as an actress. Critically maligned a year earlier in Hell’s Angels, she showed an ability to hold an audiences gaze for her actions as much as her appearance. What producers missed in assigning her this role was clear, but what was also clear was her star power and visual appeal. Thankfully, upon her return to MGM (after making Three Wise Girls for Columbia) she was assigned her star making role in Red Headed Woman and the rest is history. Strangely, it was Robert Williams who is a revelation as Stew Smith. He is a witty & engaging performer and it’s a shame he died just as Platinum Blonde opened or it seems he may have been a mainstay in the screwball comedy genre that was so pervasive in the ‘30’s. His performance in Platinum Blonde is completely natural and helps to give the movie more levity and subtlety. *Robert Williams, who played Stew Smith died of peritonitis on November 3, 1931, just 4 days after Platinum Blonde opened. His appendix burst before an operation could be completed & infection set in. He was 37. *Loretta Young was only 18 when she played Gallagher, but appeared and acted much older. The fact that Harlow was only 20 made it easier for her to appear older. *Harlow died at 26 from kidney failure (nephritis) that originated from an undiagnosed infection after scarlet fever she contracted as a 15 year old. Her mother’s interpretation of Christian Science has long been rumored to have played a part in Harlow’s death due to a delay in treatment. In fact, she was treated by a doctor during the last week of her life, but he misdiagnosed the root cause of her illness & may have enflamed the condition with his treatment (Bombshell: The Life & Death of Jan Harlow. David Stenn).